Kids were given a marshmallow each, but were told that if they could wait for the person administering the test to return, they will be given one more. The children who wanted to satisfy their cravings right away did not hesitate to finish off the marshmallow even before the adult left the room. Whereas, the kids who kept themselves busy to avoid the marshmallow temptation until the adult came back were rewarded with one more treat. Satisfaction-on-Demand or Delay of Gratification? As adults, it is hard to resist the temptation when the reward at stake is more than just a piece of sweet. Sometimes, the wiser thing to do is cave in. There are also circumstances when the most prudent course of action is to sit back and wait awhile, and then make the move. Choosing when to pounce right away, or when to circle the prey and wait for the most opportune time, is an exercise in judgment and self-restraint. In freelancing, there are seasons when projects seem to be falling on your lap left and right. Often, they also happen to be when you are busiest. Consider this scenario: You are already waist-deep in a pool of projects, and a torrent of exciting prospects comes rushing to your door. To take or not to take suddenly becomes a life-changing question. How does it compare to other projects in financial terms? If the incoming project pays better, which of the smaller projects can you give up or refer to other interested parties? How does it compare to other projects in psychological terms? If the project is more aligned with your interests and your expertise, are there other projects less appealing to you which you can refer to parties who may be more interested (and more experienced)? How does it compare to other projects in terms of time requirements? Will the project need presence that will eat up your days off? Will the project allow you other activities that you consider more important? If the project will likely become a long-term proposition, it is important that you revisit your long-term goals. Will the project allow you to save up more, faster? Will the project be a source of professional satisfaction or a source of burn out? Will it likely interfere with your otherwise sacred observance of family occasions? An Immunity Necklace, or a Noose? The right mix of questions to ask yourself and the answers to them all depend on what you wish to accomplish in the long-term. Typically, your long-term goals are those that satisfy your values and give meaning to your life. Short-term results are meant to take you a step closer to those goals. Sometimes, they steer you away. But in the end, you will have to decide which momentary accomplishments you want to pile on, because strung together, they make up a garland that will either boost you up, or weigh you down. thx for the great post. I like your way of explaining complex things in simpler way. I run a virutal women company and in the process of making it big. so the points you just have mentioned are very meaningful to me. thx again. But do come at facebook too. Great analysis because it appears to be very easy to understand. I like the questions that you should ask your self. They are really worth thinking of. I totally agree with you that sometimes we have to take risk and make sacrifices. Sometimes we also have to be patient! 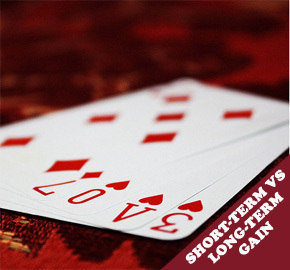 As you rightly mentioned, I don’t think there is a standard way of choosing the short term vs long term benefit. I mean of course, we are all supposed to choose that which brings the most benefit in the long run, but things are rarely so obvious. Making the right trade-off between short term benefits (eating the marshmallow right away) vs delayed gratification is generally a function of judgment and wisdom. And both come only after taking a fair bit of bad decisions :). Sometimes many short term projects is beneficial than a long term project. It is you who have to choose what you needs. Because a wrong decision might hamper your good will. Anyway- I always believe in the long term stable gaining then short term diamond. It’s safety and stability that I want.